A mutual fund is an investment vehicle through which investors pool their money to purchase securities such as stocks, bonds, money market instruments and similar assets. Mutual funds are operated by managers whose goals are to produce income and capital gains according to the fund’s objectives stated in the prospectus. Shareholders then share proportionately in the fund’s income, gain or loss. The first question you need to ask yourself is: What is my goal for this investment – long-term growth or income? Will this be for retirement purposes which may be thirty years from now? Or am I looking to supplement current income? The answer to these questions will give you a place to start. Bond and money market funds provide interest and dividends while the focus of stock funds is to increase their share price and to produce long-term capital gains. Why are mutual funds so attractive? Professionally managed. A skilled manager makes the buy/sell decisions. Picking individual stocks and bonds can be a daunting task as well as time-consuming. Since most people have a full plate with their daily lives, the idea of having a professional at the helm can bring some peace of mind. However, this doesn’t mean you can buy-it-and-forget-it. Changes make monitoring your portfolio a must – market changes, economic changes, changes in fund managers, life changes. Affordable. Initial and subsequent investments are minimal so no excuses about not having enough money to invest. If you don’t have the initial investment, begin a separate savings specifically to accumulate the amount, even if it builds at the rate of a dollar a day. Diversified. Purchasing individual stocks and bonds to create a diverse portfolio is a risky challenge, which is why a mutual fund can fit the bill. And why do you want diversification? The rationale behind this concept is that a portfolio of different kinds of investments will, on average, yield higher returns and pose a lower risk than any individual investment found within the portfolio. Liquid. Because mutual funds are actively traded, you can redeem your shares and receive the funds within days of the request. Possible taxes due despite negative returns. There is the possibility an investor may have to pay taxes on dividends, interest and capital gains while the value of the investment has gone down. Price uncertainty. While stock prices are posted as trades occur and an investor can lock in certain stock prices throughout the day, mutual fund unit prices are calculated at the end of the day. When you place an order to buy or sell, you won’t know the share price of the transaction until it is posted. There are several categories under the broad categories of mutual fund – stock, bond and hybrids, which combines investments in both stocks and bonds. Large companies have been around for awhile, tend to be stable and often pay dividends. Historically, small-cap stocks have outperformed the big boys, but their stock prices can be more volatile. The decision should be not which size “cap” mutual fund to add to your portfolio, but how much of each to include. Your risk tolerance and time horizon may dictate how you allocate your investable dollars, but there’s a place for each of these kinds of stock mutual funds in almost every portfolio. Bonds funds. As mentioned in the article “What About Those Bonds?” there are corporate, municipal, and US Treasury and agency bonds; the interest can be taxable or non-taxable. While the underlying securities in these funds are bonds with stated interest rates and maturity dates, there are a few key differences between investing in individual bonds and bond mutual funds. Ownership of an individual bond allows you the opportunity to decide when to sell that bond. With a bond fund, the manager makes that decision, which may trigger a taxable gain for you. Further, income from that individual bond is set so you know how much you will receive; because the bonds in the mutual fund are varied and changing, the income is not predictable. 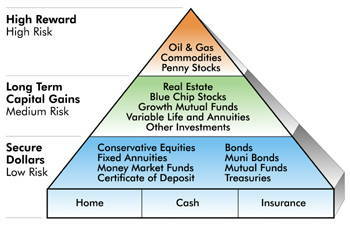 Another consideration is whether yield (interest/dividends) or credit quality is more important. Government bonds are much more secure than bonds issued by small-cap companies – and the rate of return reflects this risk. Is your time frame short-, intermediate- or long-term? While the rate of return is typically higher for long-term bond funds than short-term bond funds, there is a greater probability that interest rates and inflation will rise (and thus negatively affect a bond’s market price) within a longer time period than within a shorter period. Sector funds. As the name suggests, these mutual funds invest in specific sectors such as utilities, technology, real estate, financial, healthcare, precious metals, communications and natural resources. You can find these funds in the growth or income arenas and run the gambit as far as capitalization categories go. Index funds. This type of fund is constructed to match or track the components of a market index, such as the S&P 500 (large-cap stocks), Russell 5000 (small-cap stocks), MSCI EAFE (international stocks), Lehman Aggregate (corporate bonds), and DJ REIT (real estate investment trusts). Because these funds are not actively managed (managers’ goal is mirror the components of a market index), they have lower management fees and thus lower expense ratios (more on expense ratios later), which make them an attractive investment choice. Balanced funds. These funds keep a set mix of stocks and bonds, traditionally 60% stocks and 40% bonds, all the time. Several academic studies have shown the 60%-40% mix is the best blend to minimize volatility and increase returns. Asset allocation funds. On the other hand, an asset allocation fund varies the amount it keeps in stocks, bonds and money funds to try to get the best return. Lifecycle funds. Also known as age-based or target-date funds, the allocation of stocks and bonds in these funds automatically adjusts during the course of the fund’s time horizon, moving from higher risk (stocks) to lower risk (bonds) as the investor ages and/or nears retirement. This type of fund appeals to investors who like the auto pilot approach and convenience of one fund. However, they are not all created equal – you still have to do the research. There are several considerations when picking a mutual fund. Sales charge. This is the commission paid to a financial intermediary such as a financial adviser for his/her assistance in selecting the mutual fund that is best suited for the investor. The maximum permitted sales charge is 8%, but most loads fall within a 3-6% range. It is figured into the original price of Class A shares (front-end load). Class B shares offer a time-reduced sales charge, which means each year of ownership reduces the sales charge (back-end load). After a certain number of years, there is no sales charge. There is a sales charge for Class C shares as long as you own the fund. Mutual funds that have sales charges also offer breakpoints that reduce the sales charge percentage the more you invest. Mutual funds that do not have a sales charge are often referred to as no-load funds. Turnover rate. Other things being equal, the higher the portfolio turnover, the higher the fund’s transaction costs, and the higher the proportion of total return represented by realized (and thus taxable) capital gains. Both factors lower the return to the investor. A turnover rate between 40% and 20% per year is an acceptable range. Beta. Beta is a measure of the volatility of a security or a portfolio in comparison to the market as a whole. The market is deemed to be at 1 so a beta of 1 indicates that the security’s price will move with the market. For example, a beta of 1.10 shows that the fund has performed 10% better than its benchmark index in up markets and 10% worse in down markets, assuming all other factors remain constant. It is important to note that a low beta for a fund does not necessarily imply that the fund has a low level of volatility. A low beta signifies only that the fund’s market-related risk is low. Standard deviation. With mutual funds, the standard deviation is how much the return on a fund is deviating from the expected returns based on its historical performance. A high standard deviation for a mutual fund means the range of its performance has been very wide, indicating that there is a greater potential for volatility. When comparing two funds that have same performance, choosing the one with lower standard deviation is better because it is maximizing the returns for the risk taken on. Fund Manager. Number of years at the helm of an actively-managed mutual fund matters and when a good manager leaves it matters. For example, if you are attracted to the five-year return of a mutual fund but the manager tenure is only one year, the five-year return is not meaningful in making the decision to buy this fund. Look for at least a five-year tenure. Then monitor the manager. Past performance. Although no guarantee of future performance, what a mutual fund has done in previous years should be considered – both short- and long-term – especially compared with its peers and its Index benchmark. To see how your mutual fund measures up, check out the article: Morningstar Inc. Prospectus. Perhaps you’ve heard the investment commercials which instruct you to read the fund’s prospectus before investing. This disclosure document contains important information about the fund’s objectives, strategies, risks, earnings distribution policy, fees and expenses, fund management and past performance returns. The internet is your research friend. A variety of websites offer general information about mutual funds such as www.sec.gov (Securities and Exchange Commission), www.investopedia.com and www.wikipedia.com. Every mutual fund family has a website where you can view and compare their funds. Brokerage house websites contain research and news which can prove to be helpful in your investment decision-making.